DT's Italian Week Continues: We all have hidden secret desires. Things that we like, but don't admit to our friends. Yours, yes you dear reader, is watching that video of Britney Spears belt out Oops I Did It Again in her red vinyl body suit, but mine is worse. Far worse. You see...I have a secret crush on a certain car that...well...not many people agree...but I happen to love the shape of the Alfa Romeo Milano. There, I said it. I admitted it. And I FEEL GOOD ABOUT IT. IT'S LIBERAT---we interrupt this DT posting and bring in a new writer. 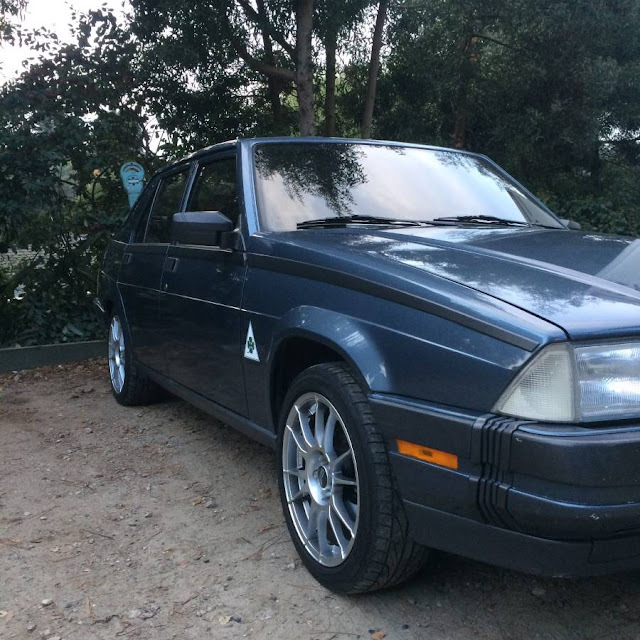 The Alfa Romeo 75 was badged in the US market as the Milano between 1985 and 1992. The Milano has the honor of being the last car released by Alfa before they were acquired by Fiat and the name 75 was in reference to the 75th anniversary of --LIBERATING. I'M BACK!! YOU CAN'T KEEP ME FROM TELLING YOU HOW MUCH I LIKE THE LOOKS OF THIS RIDICULOUS CAR AND I WANT TO OWN THEM ALL. 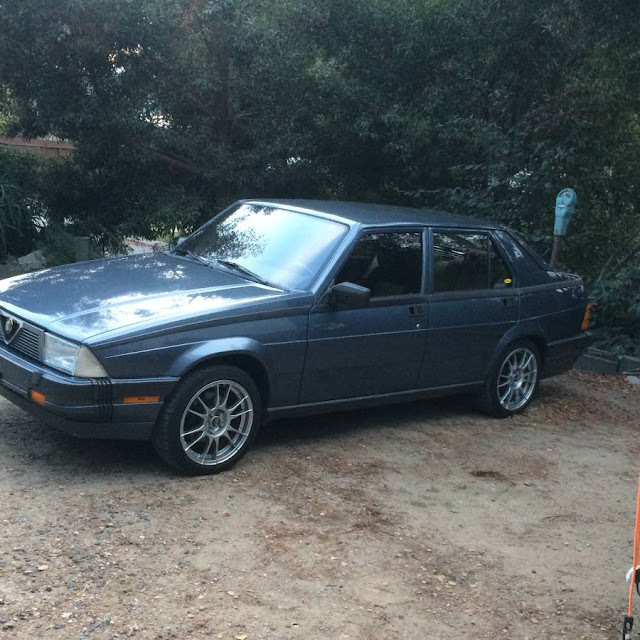 Find this 1987 Alfa Romeo Milano offered for $3800 in SF Bay Area, CA via craigslist. Tip from FuelTruck. The last of the rear wheel drive Alfa's from imported to the US before they were bought out by Fiat. This car is a great driver with just a tick over 100k. Very rare "sunfoof delete" so no leaks and rigid body structure. Owned by Alfa enthusiasts and well maintained. Upgrades include Bilstien shocks and performance springs, Ultralegerra wheels with 16in low profile aggressive tires. Recent transmission overhual with limited slip differential. Custom Anza exaust. With near 50/50 weight distribution this car handles line its on rails! Rare find in this condition with low miles and priced aggressively. Hi my name Sean and I too have lust for the Milano 75. My only issue is the side trim that makes the car look broken at the c pillar. In fact the the way the trim flows from panel to panel is funky. Now there is a seller that knows how to show mileage (100,002 miles), bot like that Volvo 1800 guy the other day, who was 3 miles short of 300,000. With a milestone in sight, I say "Go for it!". Now, onto this car. Wow, dare I call this a bargain? Looks clean and claims to be well maintained by a marque fan. If one of these is on your list, get thee to San Fran! Very nice car. Like all Alfas these handle like slot cars and turn mundane driving into a worthwhile experience. As a benefit feature if you push the front bumper the side-mounted accordions play "Napoletana". Buy it, drive it, love it. I'd caveat that with cautioning over the state of the interior before you plop down for it, but the truth is that the clean body, service history, and recent trans service make this car worth the ask alone IF the owner has proof of a relatively recent timing belt service. Clean Milanos are getting hard to find. Those of us who used to buy and sell them for $1,500 - $2k a pop might scoff at a nearly $4,000 2.5L car, but I think we're reaching the point where that's fair.